Automatic Door Closers https://laredotxlocksmith.com/commercial/automatic-door-closers/ 3.6/5 based upon 8 reviews. 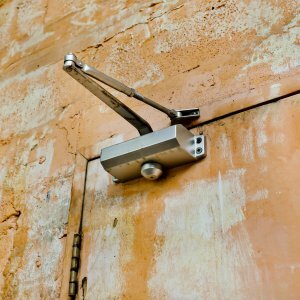 We are Laredo Locksmith Pros and our installation and repair services for automatic door closers in Laredo Texas are important for your business. If you have ever gotten frustrated because a door stays open or it has the habit of slamming shut, automatic door closers can easily be installed to fix the problem. They are most commonly installed in businesses, and our commercial locksmith experts can quickly provide installations, repair, and ongoing maintenance for you. Making the decision to schedule an automatic door closer installation is a great one. Many businesses have had significant success with these devices because it allows for the doors to close automatically. Often, doors will shut too quickly and cause a slam. Also, doors to the exterior might stay open, causing air-conditioning to leave the building and bugs to come in. So, automatic doors will prevent unpleasant noises and save you money on your energy bills! Automatic door closers are available for interior and exterior doors. We can have a local locksmith come out and provide the installation in no time at all. Should there ever be a problem with the door, whether we installed it or someone else did, we can also provide automatic door closer repair and maintenance solutions. We care about your safety and security, which is why we offer 24-hour emergency locksmith services in Laredo TX and the neighboring areas. This ensures that if you have an issue with any kind of door closer or lock, we will come out at any time of the day or night in order to make the repair. This will allow you to secure your building and continue about business as though nothing ever happened. At Laredo Locksmith Pros, we provide top-quality, professional locksmith services in Laredo Texas. We are locally owned and operated and provide mobile locksmith services to ensure that you gain the ultimate level of convenience. All of our technicians have at least five years of experience and our mobile units are fully equipped with state-of-the-art technology and tools. This makes it easy for us to make repairs on-site without having to leave and come back. We look forward to providing you with automatic door closers as well as full-service installations and repairs for any lock-related component within your home or business. You have questions and we have answers. At Laredo Locksmith Pros, we are dedicated to providing the highest level of customer service, and this includes addressing any questions or concerns that you may have. Some of the most common questions are answered below. We have a 24-hour locksmith service, ensuring you get the help when and where you need it the most. Do you offer other locksmith services? Yes! In addition to installing and repairing automatic door closers, we also work with residential and commercial locks, car locks, broken keys, and much more. Will you provide a quote before you get started? Absolutely. We pride ourselves on providing upfront costs so that there are no surprises in the end. What if I don't know what type of automatic door closers are right for my business needs? No problem! Our experts will go over all your options with you and help you make a decision based on your budget and based on what will be best for your commercial property. Contact Laredo Locksmith Pros to learn more about who we are and our services!